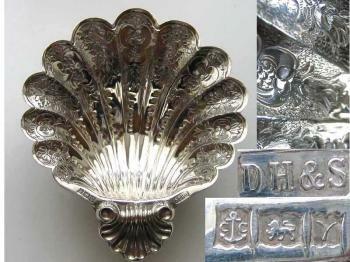 A number of hallmarks are struck on silverware crafted in Great Britain and Ireland to certify the fineness of silver (lion passant, crowned leopard head, thistle, lion rampant, crowned harp), the place and date of hallmarking (Assay Office hallmark and date letter), the payment of the duty on silver to the Royal Crown (the sovereign head and the Hibernia). 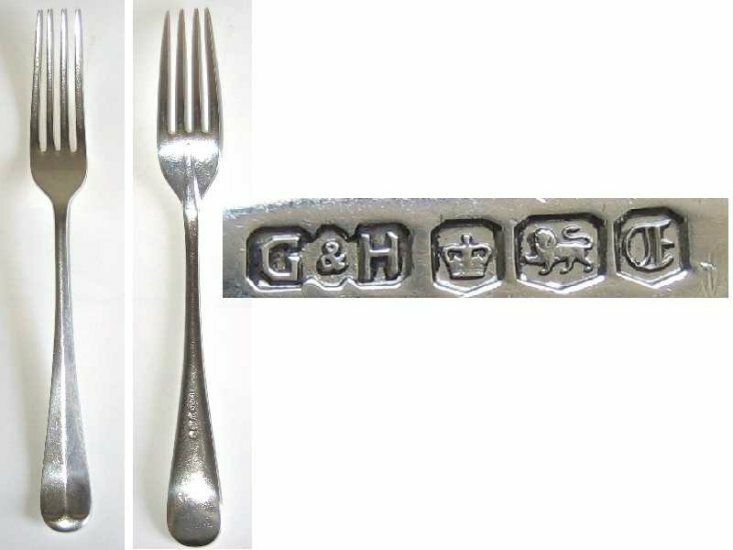 Since 1935 a number of hallmarks (usually optional ones) have been approved and struck on silverware to commemorate some important events such as the sovereign coronation and jubilee, historical anniversaries, the new millennium, etc. 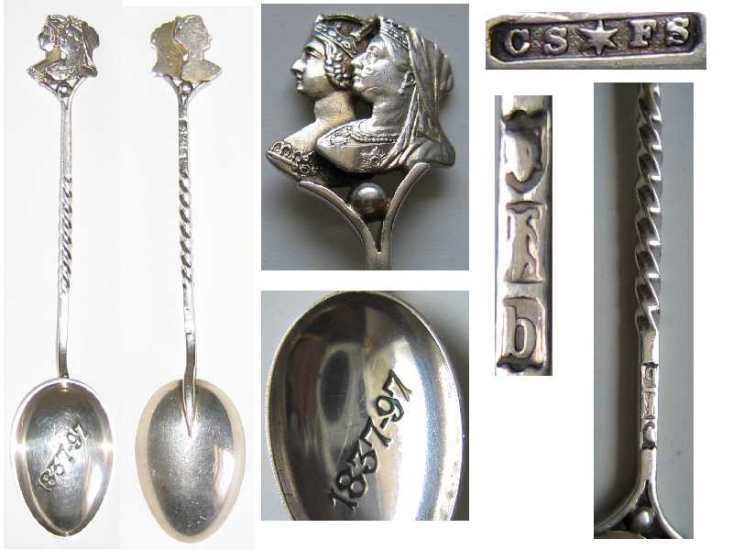 British and Irish commemorative silver pieces represent a sector of collection very interesting for their historical implications, mainly related to the British monarchy. The items bearing commemorative hallmarks are often very fine replicas of ancient and historical pieces. 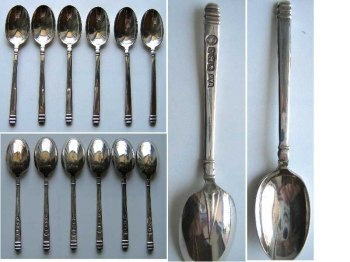 Commemorative items have obviously been crafted also before 1935 and in this case no dedicated hallmarks can be found on them. 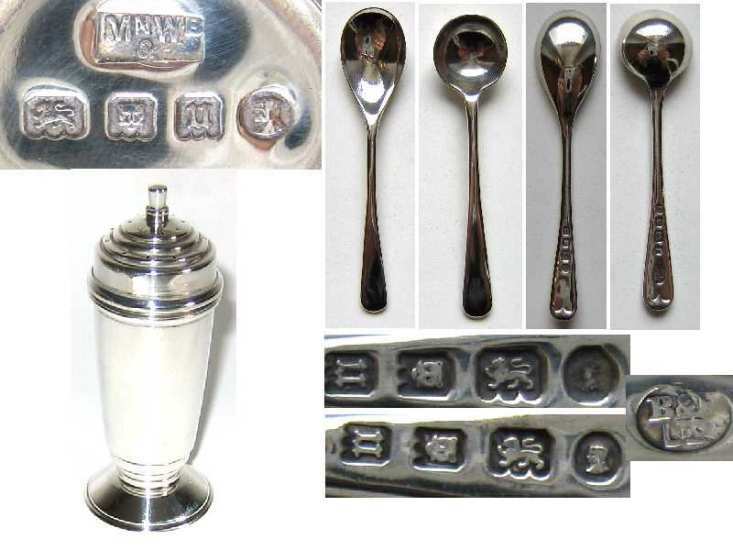 Before 1935 (in a few case also after this date), no dedicated commemorative hallmarks have been used alongside the compulsory ones. 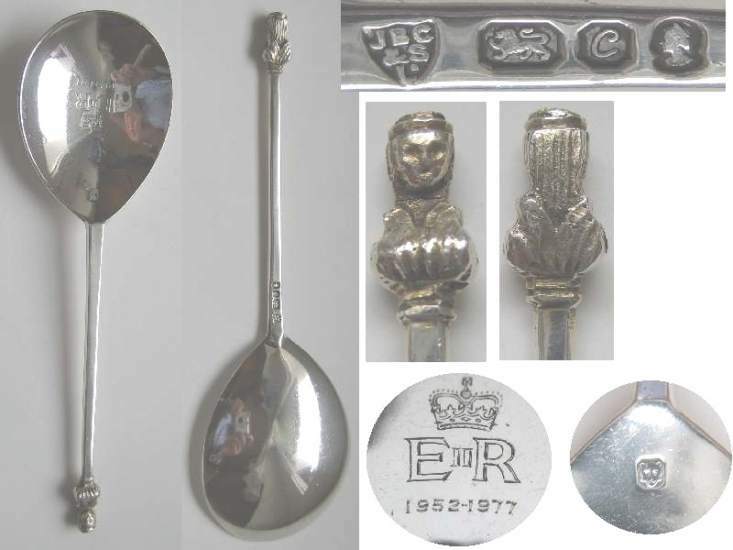 To commemorate historical events like sovereign coronation and jubilees, only inscriptions and or enamelled, embossed or engraved relevant pictures have been used, mainly on items like spoons, goblets, salvers and plates. 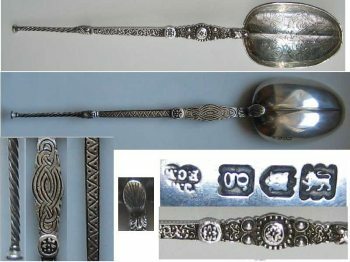 A particular item used to commemorate the sovereign coronation was the replica of the "anointing spoons" . 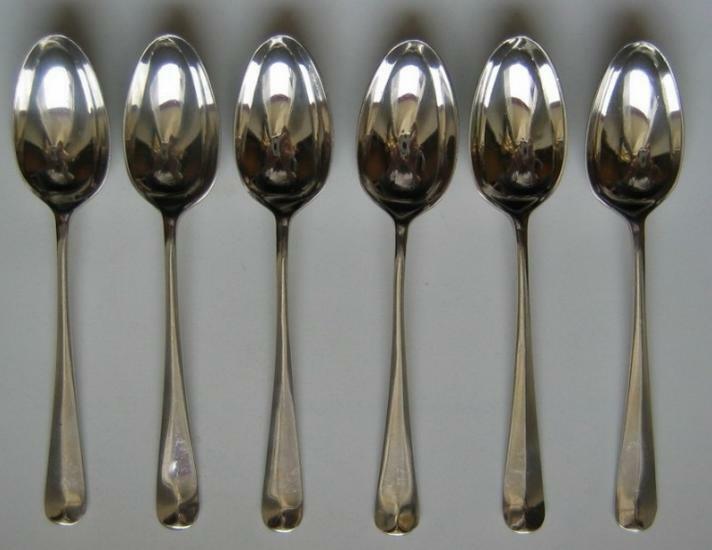 They are replica of an original silver-gilt spoon set with pearls displayed with the Crown Jewels at the Tower of London alongside the ampulla (a hollow gold vessel shaped like an eagle). It was probably made for Henry II or Richard I and it is the only piece of royal goldsmith's work to survive from the 12th century. During the coronation ceremony, when the Archbishop of Canterbury anoints the Sovereign, the anointing oil is poured from the ampulla into the anointing Spoon. The following samples are taken from private collections. Cornelius Desormeaux Saunders e James Francis Hollings Shepherd, London 1897. 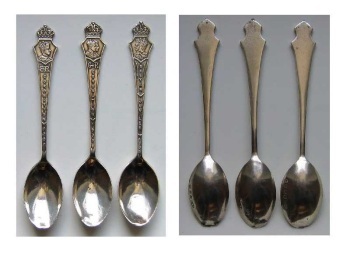 The spoon bears at the top of the handle two portraits of a young (1937) and an aged (1897) Queen Victoria. Dimension and weight: 11.7 cm, 12 g.
James Wakely e Frank Wheeler, London 1902. 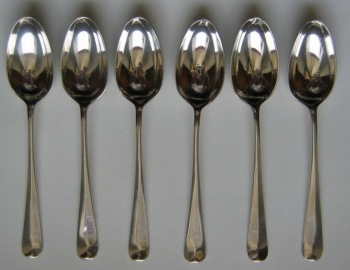 These spoons are usually the size of a dessert or of a teaspoon and are gilt. This is a rare example of a "not gilt" one having the dimension of a serving spoon. Dimension and weight:: 25.7 cm, 98 g.
-	A couple of coat of arms, probably already engraved on the piece taken as model. Dimension and weight: 3 cm high; max section 3 cm, 129 g.
The spoon commemorating the coronation of Edward VIII (above right: c), reports at the top of the handle the profile of the sovereign and the inscription "Coronation 1937". 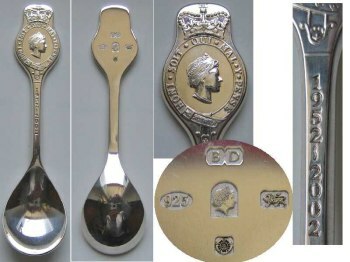 The spoon commemorating the coronation of George VI (right: b), reports at the top of the handle the profile of the sovereign and his wife Queen Elisabeth (the Queen Mother) and the inscription "Coronation 1937"
Dimension and weight: 2.5 cm, 17-18 g.
Comyns, London 1972, limited and numbered edition. Dimension and weight: 23 cm, 382 g.
Barker Ellis Silver Company, Birmingham 1970/71. Limited edition. Goblet and coaster made to commemorate the 1900th anniversary of the founding of the City of York in AD71. 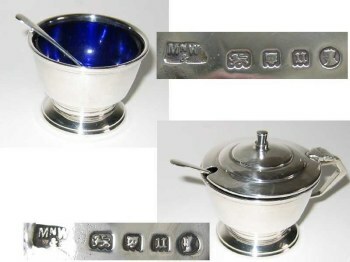 Like the ancient items, the side of the bowl carries a randomly impressed and oversized set of British sterling silver hallmarks for Birmingham 1970/71. 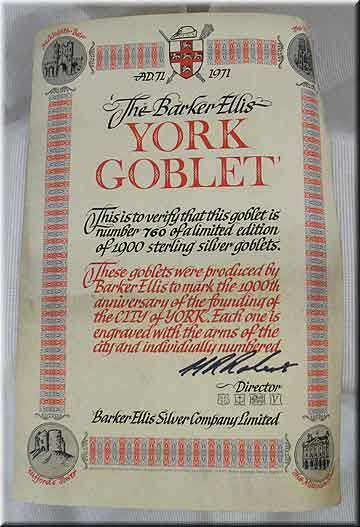 On both items the coat of arms of the City of York is engraved between the dates AD71 and 1971. 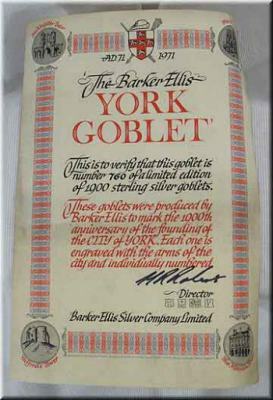 The scrolled certificate of authenticity has been hand inscribed with the number of the goblet (760 over 1900, like the years of the anniversary) and bound with a red ribbon. Dimension and weight: goblet: 11 cm high, 7.5 cm section, 145 g; coaster: 10 cm section, 97 g.
Items having commemorative hallmarks are more interesting from a collecting point of view. 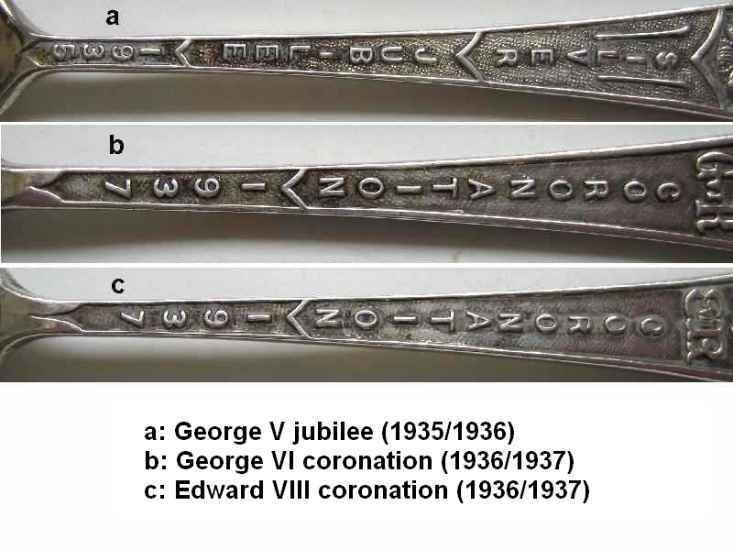 A commemorative hallmark was first introduced in 1935 on the occasion of the silver jubilee of George V. The mark reproduces the profiles of King George V and Queen Mary. 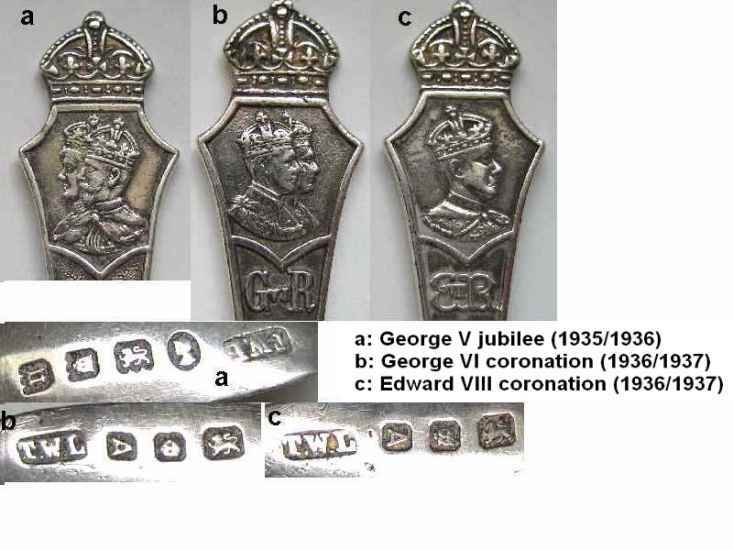 This example was replicated in 1952 (Coronation of Queen Elisabeth II), 1977 (silver Jubilee of Queen Elisabeth II) and 2002 (golden Jubilee of Queen Elisabeth II) with hallmarks reproducing the profile of the Queen, but different from one to another. Coronation and Jubilee hallmarks should not be confused with duty marks, also reproducing the sovereign profiles, but in use only between 1784 and 1890. 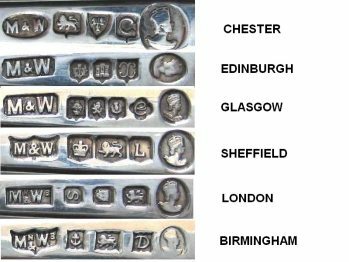 In 1973, to commemorate the bicentenary of the Birmingham Assay Office, the Birmingham hallmark (anchor) was struck bearing two C (two hundred in Roman numbers) one at each side of the anchor. 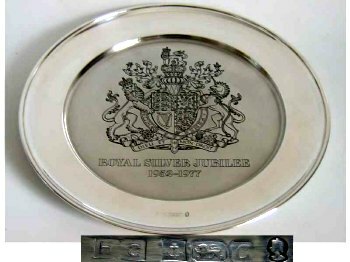 In the same year, the bicentenary of the Sheffield Assay Office was commemorated by impressing the same date letter used in 1773 (a capital gothic E). This produced a discontinuity in the date letter succession of the series starting from 1968 with two consecutive capitals E (the first one in cursive and the second in gothic). 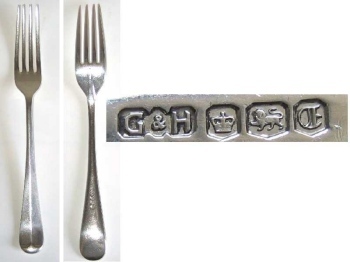 This date letter series ends with a G (for the year 1974) because since 1975 a new symbol for the Sheffield Assay Office was adopted (the "Tudor rose" subsituted the "crown") and a new series of date letter was then started (ENDNOTE 1). 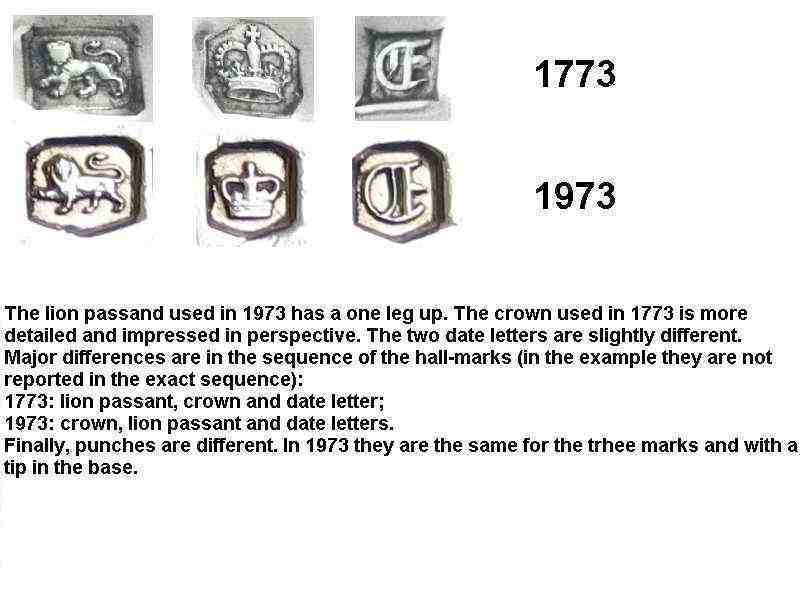 This can result in some difficulty in discriminating modern hallmarks for 1973 from the ancient 1773 hallmarks (very rare and sought after by collectors) (compare the hallmarks). 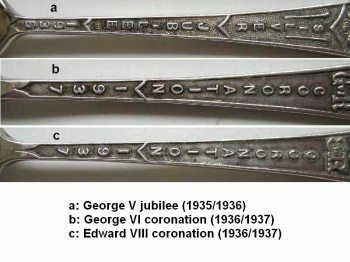 In 1935 and 1952, on the occasion of the use of the Coronation some English manufacturers produced six spoons sets bearing each one a different hallmark of one of the six Assay Offices then active in the UK (London, Birmingham, Sheffield, Chester, Edinburgh and Glasgow). This was not possible in occasion of the Silver and Golden Jubilee of Queen Elisabeth II, because at that time only four Assay Offices were still active (Chester closed in 1962 and Glasgow in 1964). 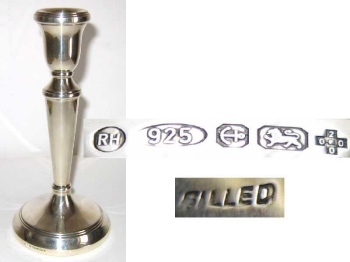 The last commemorative hallmark to be mentioned is the Millennium mark, struck on silver items assayed in 1999 and 2000 and consisting in a cross with the number 2000 and a dot on its centre. The bottom page table illustrates, in chronological order, the commemorative hallmarks used in the United Kingdom between 1935 and 2002. The photos below, obtained by items belonging to "private collections", illustrate all the commemorative hallmarks used between 1935 and 2002. 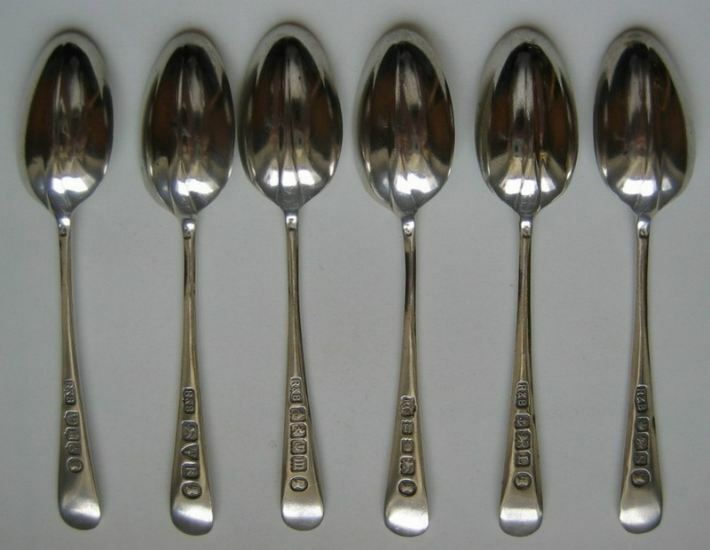 Mappin & Webb (the spoons are marked MN&WB e B&F Ltd), London 1935. The commemorative hallmark is the profile of King George V and Queen Mary. Dimension: pepper 9 cm high, max section 3.8 cm: salt cellar 4 cm high, 5.5 cm section; mustard pot 6 cm high, 7.5 cm section; salt spoon 5.5 cm; mustard spoon 6 cm. Weight: pepper 46 g; salt 36 g; mustard pot 61 g; salt spoon 4g; mustard spoon 5g. The commemorative hallmark is the profile of King George V and Queen Mary. The spoon (see on the left: photo a), reports at its top the head of King George V and Queen Mary and the inscription "Silver Jubilee 1935". Dimension and weight: 2.5 cm, 17 g.
Robert & Belk, London, Birmingham, Sheffield, Chester, Edinburgh and Glasgow, 1935. 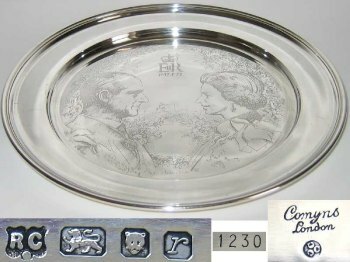 The commemorative hallmark is the profile of King George V and Queen Mary. 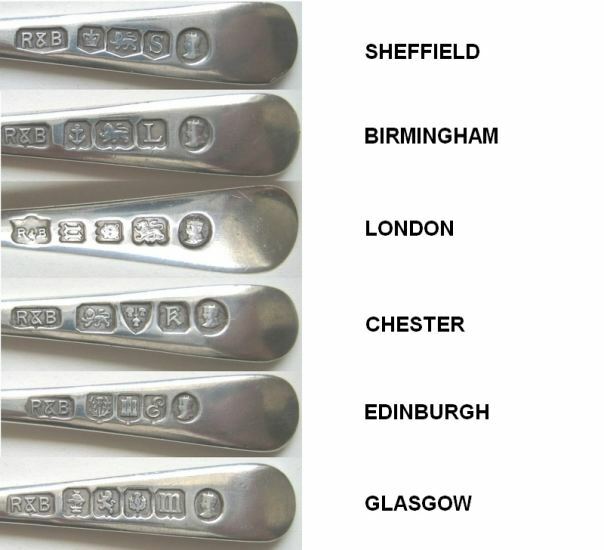 Note the difference in maker marks registered at the six Assay Offices. Dimension and weight: 11 cm, 81 g (overall weight). Mappin & Webb, London, Birmingham, Sheffield, Chester, Edinburgh and Glasgow, 1953. The commemorative hallmark is the head of Queen Elisabeth II. 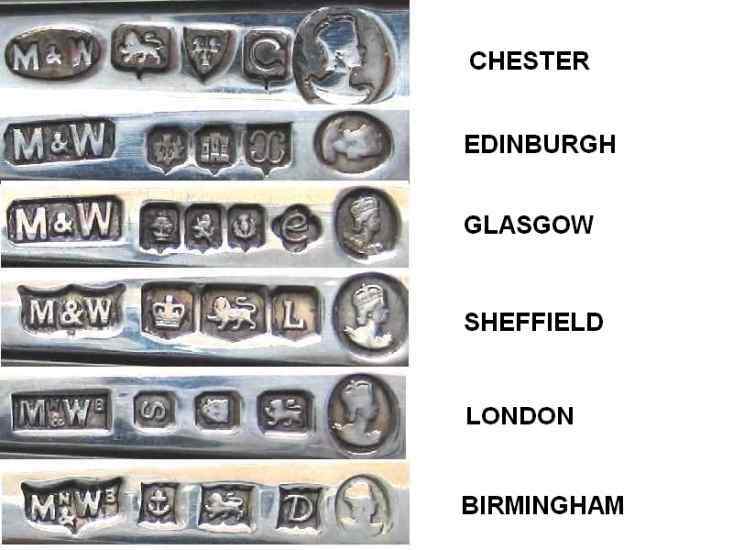 Note the difference in maker marks registered at the six Assay Offices. Dimension and weight: 10.5 cm, 72 g (overall weight). Maker DH & S, Birmingham 1973. The Birmingham hallmark (anchor) bears "CC" (two hundred in Roman number) one at each side of the anchor. Dimension and weight: 135 x 11.5 x 4.5 cm high, 121 g.
Maker G & H, Sheffield 1973. This date letter was first used in 1773. Dimension and weight: 20.5 cm, 72 g.
Maker HC, London 1977, limited and numbered edition. The commemorative hallmark is the profile of Queen Elisabeth II. 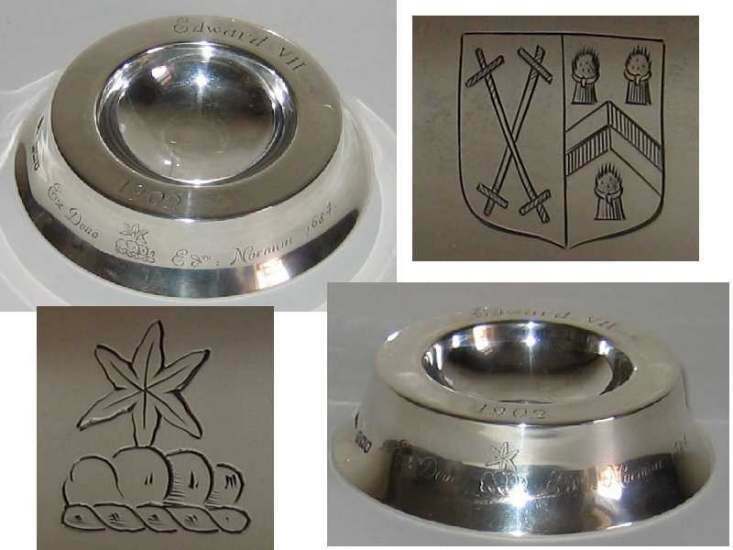 Engraved on the salver is the he Royal Coat of Arms of the United Kingdom, with the motto of the British monarch, first adopted by Henry V (1413-1422), "Dieu et mon droit" ( French for "God and my right")(ENDNOTE 2). 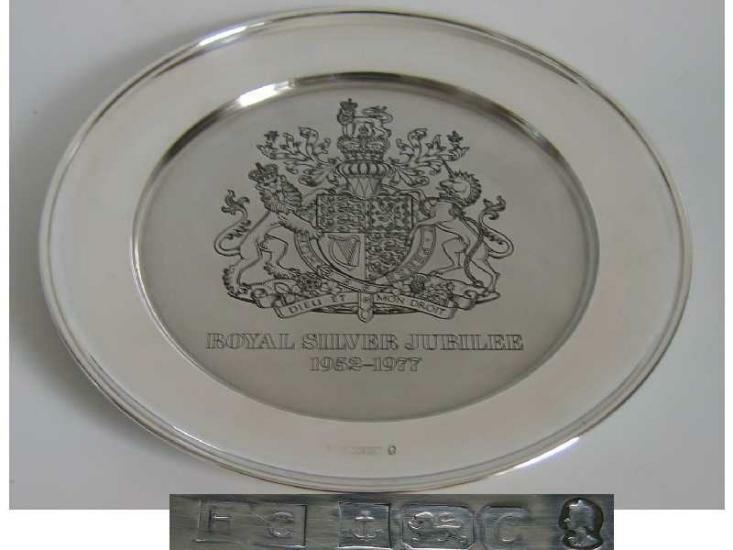 Also engraved "Royal Silver Jubilee" and the dates "1952-1977", for the Silver Jubilee after the Coronation of 1952. Dimension and weight: 25.5 cm, 402 g.
Maker J.B.C. &AMP; S. L., London 1977. The commemorative hallmark is the profile of Queen Elisabeth II. Engraved on the spoon the initials EIIR (Elisabeth II Reine: French for Queen)(ENDNOTE 2), with the Royal Crown above. 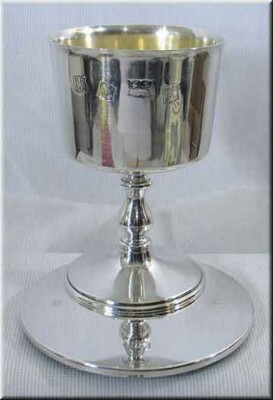 Also engraved the dates "1952-1977", for the Silver Jubilee. 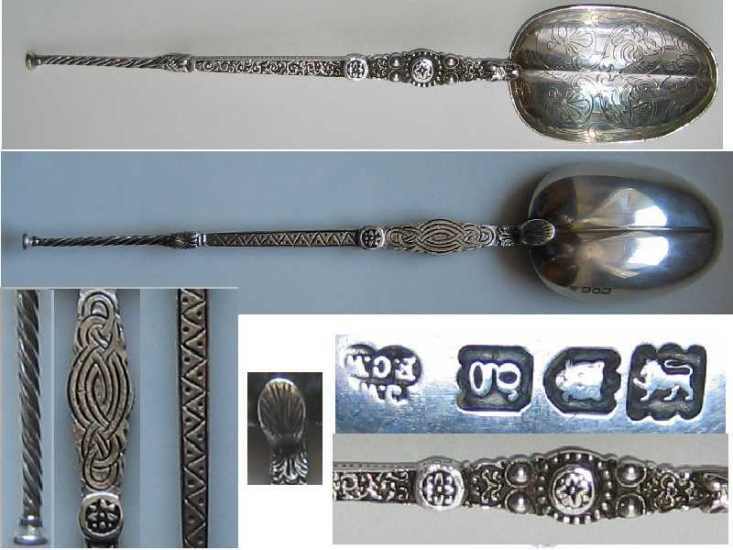 The leopard head (which was the hallmark for sterling silver until 1544) was struck in the upper part of the bowl likewise at the time when this kind of spoon was in use (end of 1400 � half of 1600). 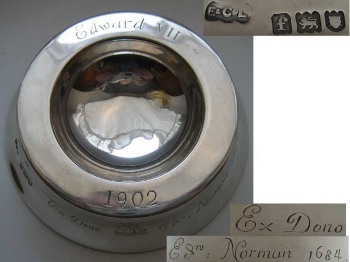 Dimension and weight: 15.5 x 4.7 cm, 40 g.
The commemorative hallmarks are the number 2,000 in a cross with a dot at its centre. Since 1999 la finesse mark for sterling silver is the number 925 in an oval. The &QUOT;traditional marks&QUOT; lion passant and date letter became optional after 1999. In this case the lion passant was struck but the date letter omitted. Dimension and weight: 19 cm high x 8.5 section at the base, 237 g.
The commemorative hallmark is the head of Queen Elisabeth II. 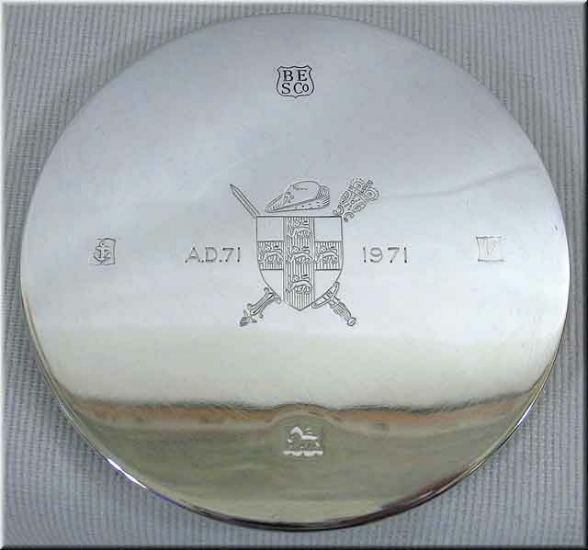 ENDNOTE 1: The first date letter used by Sheffield Assay Office at the date of its opening in 1773 was not an A but a gothic D. Contrary to the other main Assay Offices where the sequence of the date letters followed an alphabetical order, Sheffield adopted a random sequence from 1773 to 1823. Coronation of Queen Elisabeth II. 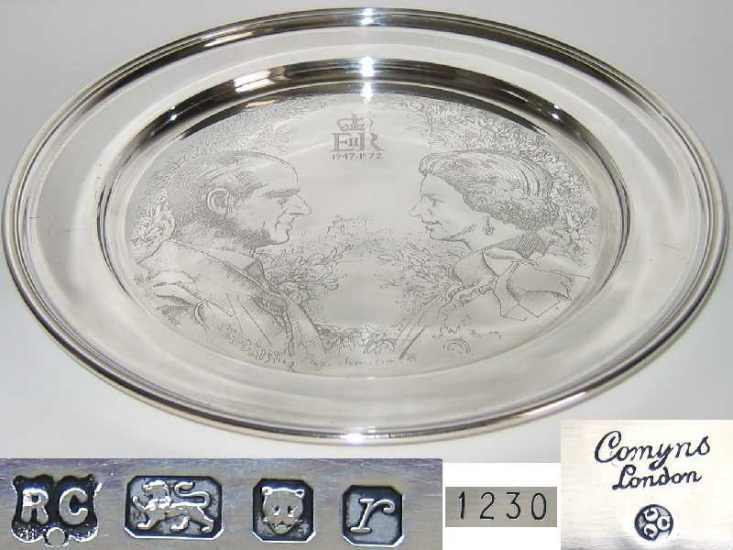 Profile of crowned Queen Elisabeth looking right in an oval punch. Bicentenary of the opening of the Birmingham Assay Office. Bicentenary of the opening of the Sheffield Assay Office. Profile of Queen Elisabeth looking left. 2,000 in a cross with a dot at its centre. Profile of Queen Elisabeth looking right in an arch shaped punch. (2) as found on real items. (3) in the facsimile reproductions the relief (cameo) part is conventional in white and the incuse part of the hallmark (including the field of the punch) is in black.